The contractor handling the construction of 10-lane Oshodi-Murtala Muhammed International Airport Road, Messrs Hi-tech Construction Company has acquired a new Wirtgen WR 250 Recycler machine to speed up work on the construction work, with an assurance to deliver the project by December 2018. The Lagos State Government had embarked on the reconstruction of the Airport Road to transform it from the state of decay to international standard being a major gateway to the State and Nigeria. The scope of the project includes two flyovers, one U-turn Bridge, five pedestrian bridges, and multiple laybys, among others. 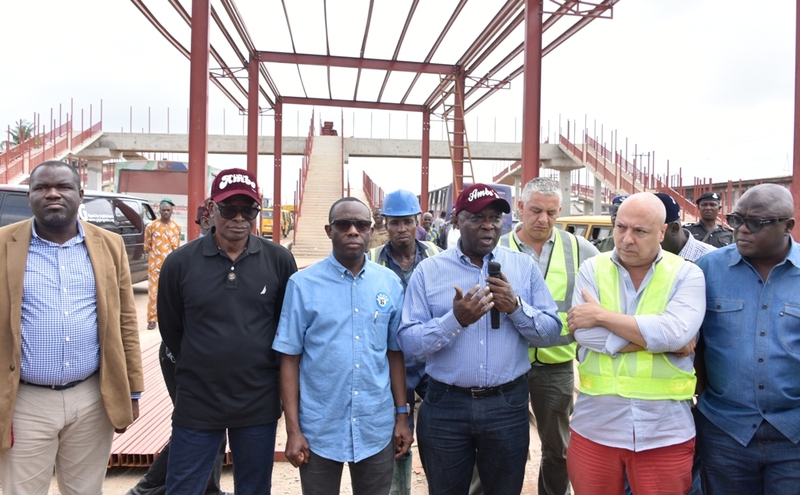 Speaking while unveiling the new machine during an extensive inspection tour of ongoing projects across the State by the Governor, Mr Akinwunmi Ambode, Hi-tech’s Managing Director, Mr Ivan Becker said the new equipment which has the capacity to construct 400metres daily would go a long way to facilitate the delivery of the Airport Road on schedule. Managing Director, Planet Project Limited, Mr. Biodun Otunola; Special Adviser to the Governor, Finance and Audit Control, Mr. Adeniyi Popoola; Director, LAMATA, Mr. Abiodun Dabiri; representative of Lagos State Governor and Commissioner for Works & Infrastructure, Engr. Adebowale Akinsanya; Senior Project Manager, Laralek Ultimate Construction Company, Gianluca Rodinis and Project Manager, Laralek Ultimate Construction Company, Mr. Saba Jubril during inspection of the ongoing construction of the Oshodi-Abule Egba BRT corridor, at the weekend. Responding, the Governor, who was represented by Commissioner for Works and Infrastructure, Mr Adebowale Akinsanya, said it was gratifying to note that the project was progressing well with all the components now at advanced stages, just as he expressed optimism that the new equipment would facilitate prompt delivery of the project. The Governor, who also inspected the progress of work on Oshodi-Abule Egba Bus Rapid Transit (BRT) corridor and construction of network of roads in Ojokoro, specifically appealing to residents to bear with the State Government over inconveniences they might be experiencing as a result of the multiple infrastructural projects going on across the State, saying that all hands were on deck to deliver the projects on schedule. He said aside the fact that various measures had been put in place to mitigate impact of the construction on residents, more impactful projects would be delivered to make life comfortable for residents and visitors. “One of the key things for his Excellency the Governor is Southwest integration and some of the roads we are doing right now in Ojokoro link Ogun State. The roads were specifically embarked upon to complement the network of roads and bridges that we already constructed in Alimosho. “As we are constructing roads in Ojokoro, we are also doing the same in other parts of the State but the key thing is that the State Government cannot do it alone; we are partners with the citizens. So, I appeal for the patience and understanding of everybody. To residents, please bear with us, work with us and things will get done quickly. He said the network of roads in Ojokoro were being done based on the function of the areas and not one-size fits all, saying that in some waterlogged areas, government would be using paving stones, while asphalt would be used in other areas. The more than 20 kilometers network of roads include Aremu Street, Alhaji Luqman, Amusa Agbaje Street, Abu Balogun Street, Philip Majekodunmi Street, Unity Road, Osho/Udeh Brown Road, Oshota/Aina Streets, Home Science Road, among others. 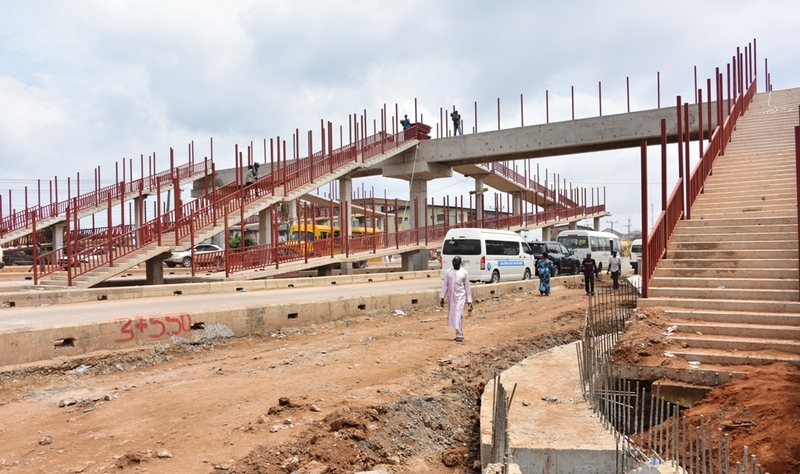 While inspecting the 13.5 kilometers Oshodi-Abule Egba BRT corridor along the Lagos-Abeokuta Expressway designed with 14 bus stations and 14 pedestrian bridges, the Governor said though the construction was being delayed due to dense population in the axis but that the project would equally be delivered by December 2018. “This is a highly populated area but the contractor has been mandated with the Managing Director of Lagos Metropolitan Area Transport Authority (LAMATA) to do everything possible to make life bearable and easy for all road users. The work during the day is being limited right now and a lot more would be done at night. “The traffic is better than before and there is a lot of rehabilitation of existing road going on and it will continue. This is an ongoing exercise but we need the cooperation and support of the people to make it workable. It is just a matter of time, this will be done and there will be a big relieve coming to this axis,” he said. He said as part of the phase two of the project, more pedestrian bridges would be constructed especially between Abule Egba and Sango Otta, the boundary of Lagos with Ogun State. “The phase one is from Oshodi to Abule Egba. Phase two from Abule Egba to Old Toll Gate in Sango Otta will follow after that and the key thing is the care of pedestrians which we are taking very seriously. So, you will see a lot of pedestrian bridges. Between Abule Egba and Otta, there will be more pedestrian bridges coming which will be part of phase two of this project,” he said.